Only me again! Leila Hardy, your online Intuitive Life and Business Coach! If you're anything like me, life is busy! Helping others, building a spiritual business, being a wife, mum to our two fur babies, there's a lot to squeeze into a day! But what I have found is that Reiki has really helped me to make the most of my everyday tasks and enhance them, so I am enhancing my wellbeing, my energy levels and intuition at every opportunity! What's amazing is, you can do this too, in these 6 simple ways! I love supporting women who are empaths, intuitives, healers, holistic therapists and coaches to fulfil their soul's purpose with unstoppable confidence and ease by clearing out the subconscious and energy obstacles that are in your way around your incredible abilities, making money, having success and maintaining your energy levels and health. Reiki is a huge part of my success, both personally and professionally, so I love to share the benefits of learning about Reiki, your intuition and energy with others! Mantra - Repeating the five Reiki principles out loud as your morning affirmations is a powerful way to set your busy day up for success! Home - When you are in your house, to each room, visualise Reiki energy flowing through to clear the space-don't forget the corners of the rooms! Food - Place your hands over a meal you're about to consume to channel positive Reiki energy to help with digestion, absorption of the nutrients and to enhance the taste and flavours! So there you have it! 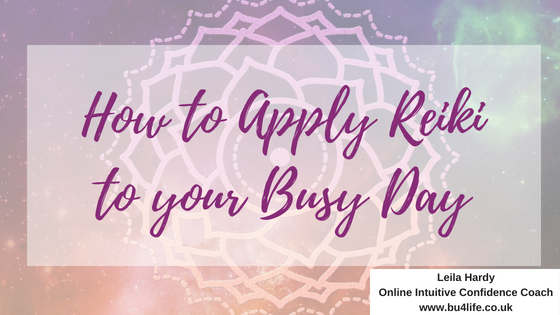 6 amazing ways to apply Reiki within your busy day-what will you try today? Let me know in the comments! I hope you are enjoying these useful tips-let me know that you are and please share these with those you know would love to learn these things too! Aug 11 What happens during a Reiki Session?